The thing about traveling in Africa is that there is no way you can really describe what it is like to someone who hasn�t been there. However that won�t stop me from trying, as this somewhat lengthy trip journal will show. But really, my motive for writing this detailed account is selfish; I want to be able to remember every detail of the trip - to relive it through writing about it, and again later on by re-reading it. And if others are also interested in hearing about the journey, then so much the better. My friend Jineen and I take a vacation together every year, and we decided to visit Africa this past summer. I had been twice before and Jineen had gone once, and we had both absolutely loved it. I had last been there in 2000, on safari in Kenya and Tanzania � the Serengeti and the Maasai Mara are awesomely beautiful, but we wanted to try something a little different this time. Having read some magazine articles about horseback safaris, we were keen to give it a go. I contacted John Spence at Aardvark Safaris in California, and he did a great job of arranging our holiday. I told him what our interests were, when we could travel, and what our budget was, and he custom-designed an itinerary for us. John visits all the destinations for the trips he books, so he can give firsthand advice on the best places to go. We wanted to stay in one general area rather than spend a lot of time traveling from place to place. We preferred smaller lodges and camps that were not too crowded, and wanted to ride good horses that were well cared for. We wanted to see beautiful scenery and lots of wildlife, and to spend as much time as possible out in the wild. We were not interested in fancy luxury hotels, but we also did not want to be wildly uncomfortable. John suggested the Limpopo River Valley in Botswana. He booked us for a week of game-viewing drives while staying at two different lodges, and then a week on a mobile horseback safari, camping in a different spot each night. He told us to expect great animal viewing and a real wilderness experience. At the time of year we were going there would be no insects and the weather would be cool. Pack warm clothes, John suggested, as July is winter in the Southern hemisphere. But we were more concerned with trying to pack light, which wasn�t easy since we were staying two weeks and had to our bring riding gear. And anyway, we thought, its Africa � how cold can it be? We weren�t looking forward to the long travel time to Botswana. Our itinerary was less than optimal; we were using frequent flier tickets, so we had to take what we could get. Ten and a half hours flying time from Washington Dulles to Accra, Ghana. Then two hours more to Lagos, Nigeria, where we would layover before changing planes and continuing another six hours to Johannesburg, South Africa. From there we had a six hour shuttle ride north to the border of Botswana. So leaving the farm at 7:00 p.m. July 8, we would arrive in Botswana around three in the afternoon July 10. When we arrived at Dulles Airport, we met up with our friend Nancy, who works at United Airlines. She gave us a behind-the-scenes tour of the offices and control rooms down below the gates, �where all the real work gets done,� she said. When we got to our gate, we were amazed and delighted to find that Nancy had managed to get us bumped up to Business Class for the flights as far as Lagos. Life was good! Our flight out of Dulles was several hours late taking off and it was near midnight by the time we got off the ground. It pays to have friends in high places; with room to stretch out in Business Class and the help of an Ambien, we were able to get a bit of sleep. Ghana looked green and rainy from the window of the plane. Accra appeared to be quite a large city, but with dirt (or mud) roads. We spent our layover in the First Class lounge; I could definitely get used to that! We continued on to Lagos, where we de-planed with some trepidation � we had heard enough about corruption and crime in Nigeria to be somewhat apprehensive about our layover there. On arrival we were immediately separated from our passports, which did nothing to restore our confidence. We were instructed to collect our luggage and present it at customs, but it had been checked through to Johannesburg � this did not make the Customs official happy. We were directed to sit on a bench and wait � for what we were not sure. We were joined by two other Americans in the same situation. Presently a uniformed guard approached us, holding our passports, and instructed us all to follow him. The airport was unbelievably packed, and we were the only Caucasian faces in sight. The guard escorted us through the crowded terminal, cutting to the head of long queues and bypassing security checkpoints. We weren�t really sure why we were under his protection, but we didn't complain. Our tickets were booked through United, but the last flight was on South African Air, so we did not actually have boarding passes � apparently E-tickets are not the norm in Nigeria. We were better off, however, than the other American lady who had joined us; she had been rerouted through Lagos after missing a connection, so she had no actual reservation. An official led her off, protesting, to a claustrophobic little room packed with people. We wondered if she would ever be seen or heard from again. For that matter we didn�t know if we would be seen or heard from again. I started looking around for someone to bribe. Eventually the guard who was helping us got our boarding passes sorted out. He escorted us through security and left us in a shabby waiting area in a corridor. When we went downstairs to visit the grimy little bathroom we noticed bullet holes in the glass doors. After a long wait and some very inconsistent security measures, to our great relief we finally boarded the plane. Whew, Nigeria had been even scarier than we had expected! As we started our descent, the pilot welcomed us to Johannesburg, telling us that the temperature was 2� Celsius and the time was 7:45 a.m. Two degrees, we pondered, which would be 35� in Fahrenheit � that couldn�t be right � but the 7:45 alarmed us. Our flight landed two hours late, and we started to worry that we would miss our shuttle bus � we had no idea what we would do if that happened! The airport was huge and modern, and it took forever to get our bags. But eventually we found our driver holding up a sign that said �Dawson,� and we were her only passengers. We left the airport and headed north. South Africa is very modern and wealthy compared with most of the continent, and the roads were good. We passed some huge houses, noticing that every yard was surrounded with high fencing topped with rolls of barbed wire. Leaving the city, we passed first through suburban areas, and then through towns and farmland. We stopped for fuel and breakfast, and then continued on the road north. After nearly six hours, we arrived at the Border Authorities. We stopped to have our passports stamped, and then drove on, commenting how the road changed at the border from fast pavement to a narrow dirt track. But fifty yards further on, the track ended altogether before a wide green river. The Limpopo River is the border between South Africa and Botswana, and at the Pont Drift border crossing there is no bridge. 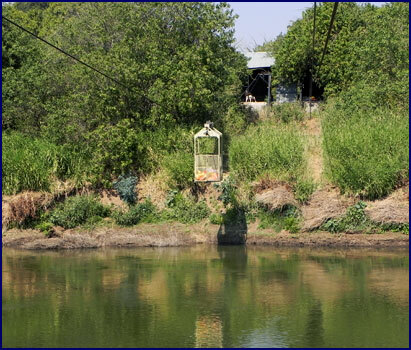 We crossed into Botswana by cable car, dangling in an open wire cage about four feet by six, suspended from a narrow cable above the surface of the water. Close up and personal to Kipling�s �great grey-green greasy Limpopo.� I wondered if there were crocodiles. We were met on the Botswana side by Simon, a guide from the Tuli Lodge. He loaded us and our luggage into an open Landrover. He asked us where we were from, and when we told him Virginia, he started singing Country Roads, Take Me Home. No, that�s West Virginia, we corrected him, but I find that people around the world don�t understand the distinction. After a short drive we arrived at our destination, Tuli Lodge, almost forty hours after leaving home. The lodge was quite lovely. It had a large open-sided lounge room, rustic but comfortable. 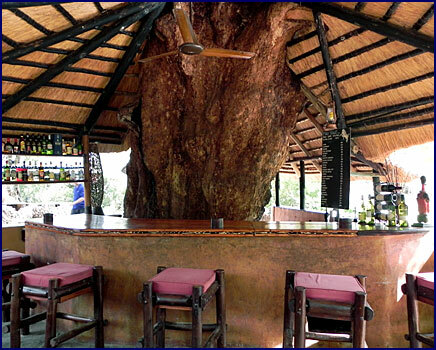 The bar was built around the trunk of a huge thousand-year-old mashatu tree. Stone-paved paths led among the trees and cabins, with sculptures of animals set amid the shrubs and flowers. The grounds were lush and green, with the aid of constant sprinklers. On one side the lawn stretched down to the Limpopo River, and on the other it ended at the foot of a steep rocky cliff, which had a man-made waterfall running down it. There was a nice swimming pool, but the weather seemed too cold for a swim. We sat on the stone patio by the bar, overlooking the lawn, sipping our welcome drinks and relaxing. Then we were shown to the Elephant Room, in its own little thatch-roofed cottage, our accommodations for the next four nights. We joined the other guests in the lounge at 3:30 p.m. for high tea. The food was excellent, and the tea supplied much needed caffeine. Though very tired from travel we didn�t want to miss a thing, so we were ready to go at four o'clock for a game-viewing drive with the guide, Simon. Our vehicle for the game drives was a roofless Landrover with three bench seats of ascending height behind the driver. A rifle was secured to a rack above the dashboard. There was also a little jump seat above the front of the hood where a game spotter could sit. We were joined by an English couple with two teenage kids, all of them quite interested in photography. In a pinch the �rover could hold up to ten passengers, so it was very comfortable for six. 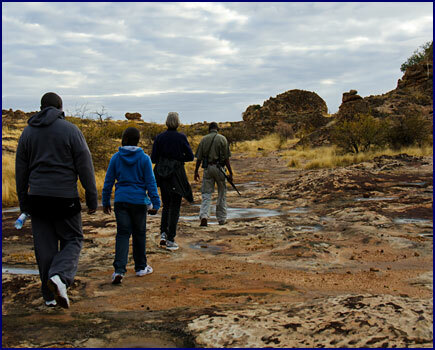 Leaving the camp, we passed the big rocky ridges behind the camp and set out across the bushveld. The day was cloudy and cool, but quite pleasant. Scrubby trees and thickets of bush dotted the terrain, and being the dry season, the grass was sparse and brown. Large kopjes rose out of the plain, these rugged rock formations reminding me of the American southwest. In comparison, the Tuli Lodge was an oasis of lush green in the middle of the dry and somewhat inhospitable land surrounding it. We saw impalas right away. 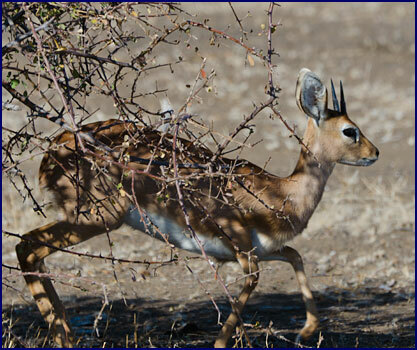 These graceful antelope were by far the most common animal in the area � they were everywhere. Similar in size and build to our white-tailed deer, they have two-toned brown coats with white and black markings around their tails. The males have long curving horns. When frightened they leap high in the air as they run, kicking their hind legs up to release a scent from a gland near their heels. At first it was quite exciting to see them, but they were so numerous that soon the novelty wore off. There are a lot of interesting and beautiful birds in Africa, and we enjoyed seeing and identifying them. Before we were 100 yards from camp we spotted a pair of crested barbets, small brightly colored birds with yellowish-green heads and tufted topknots. I�m sure it was evident that it was our first game drive, because we spent way too long watching and photographing them. It turned out they are quite common, and we saw them virtually every day for the rest of the trip. Simon diplomatically concealed his amusement and pointed out a hornbill, another bird we greeted with excitement but subsequently saw on almost every drive. 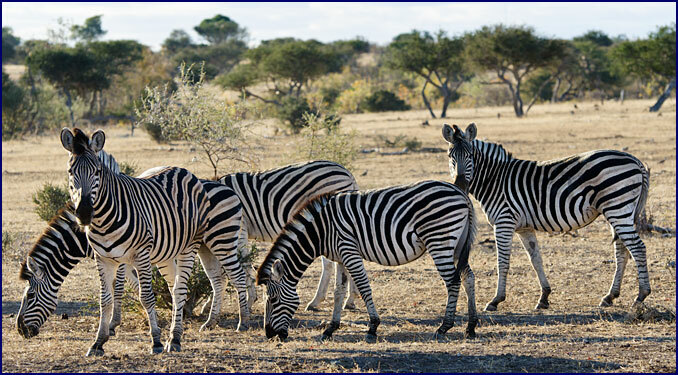 Much to my delight, a bit further on we came upon a small herd of zebras. They have roly-poly bodies like fat ponies, and big round ears. 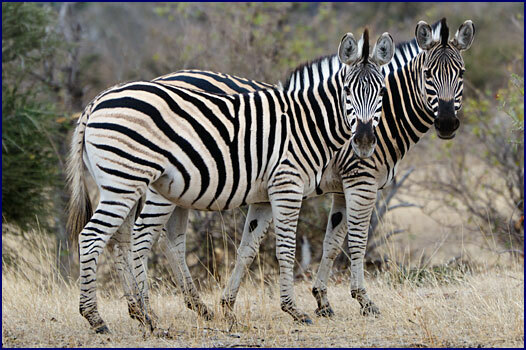 Their vivid black and white stripes are mesmerizing, and each zebra has its own individual pattern, as unique as fingerprints. Not surprisingly, this cousin to the horse is one of my favorite African animals. These had been rolling in the mud, so their white stripes were quite brown. Close by was a small herd of wildebeests. These comical antelope are known as the �spare parts animal.� The story goes that after God created the animals, he took the parts he had left over and put them together to make the wildebeest. Watching them run and cavort, they really are somewhat ridiculous looking. Although they do not populate the Limpopo valley in vast herds like they do in the Serengeti, we did see them on nearly every game drive. On top of a high rock outcropping, two klipspringers were silhouetted against the sky. These tiny members of the antelope family stand less than two feet tall, and like to inhabit the high places. They are extremely agile, leaping from rock to rock. They watched us for a few moments, and then turned and disappeared from view. Simon drove slowly on the dusty tracks, scouting for game. When he saw something of interest he would maneuver as close to it as he could, turning off the Landrover engine and coasting the last twenty feet to position us for photographs without alarming the animals. He was extremely knowledgeable about the wildlife, and told us all about the habits and life cycles of the animals we saw. We found some more zebra, and they were hanging out with a small herd of elands. Bringing to mind a Brahma bull, the eland is the largest of the African antelopes, and the males can weigh up to 2000 pounds . Despite their attractive spiral horns, the elands reminded me of big cows. Simon told us they are shy and somewhat elusive; they are probably worried about becoming beefsteaks. As the evening light was waning, we came upon a pair of giraffes. We watched these elegant creatures browsing the tops of trees. The male seemed to be courting, but his love interest was not impressed; she moved off with slow ground-covering strides while he followed hopefully. As it became fully dark we stopped by a watering hole, where there was an open-sided shelter with a thatched roof and a terrace. It was getting quite cold, and we put on the light jackets we had brought along. Simon served us an African white wine and some little crunchy things that may or may not have been chicken tenders. Soon it was pitch dark. We climbed back into the �rover, huddling together for warmth. To our delight, Simon had a powerful spotlight, and as he drove slowly along the rough track he swept the light beam from side to side, looking for animals. He would spot them by the glow of their eyes, and he could tell which animal it was by the color of the eyes, how close together they were, and how far off the ground. 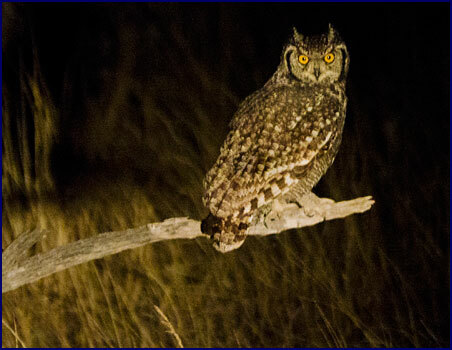 It was fantastic to drive through the dark, searching, getting a chance to see some of the nocturnal animals that rarely appear in daylight. We saw an eagle owl sitting regally on a tree branch. A rabbit scampered across our path, probably seeking a hiding place from the owl. Simon pointed out a steenbok sleeping under a bush; we held our breath as a hyena skulked by very close to it, but the tiny antelope remained undetected. 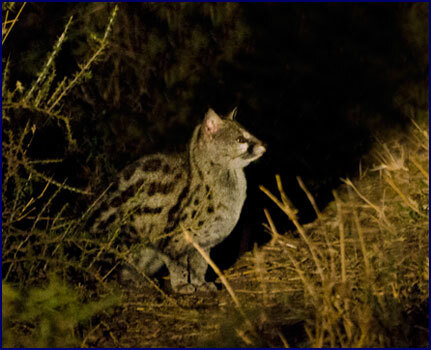 We also got a glimpse of a genet, its lithe body sleek and catlike, hunting in the night. The temperature was dropping. By the time we got back to the lodge in the open Landrover, we were shivering with cold; we definitely had not dressed warm enough. An excellent dinner was served in an open-sided room near the lounge � we wore our warmest jackets while we dined. We retired to the Elephant Room, which was very luxurious, with comfortable beds draped with mosquito netting, a spacious bathroom with a large shower and bathtub, ample storage shelves, desks, and a wardrobe complete with monogrammed bathrobes and slippers. The only thing missing was any source of heat. We did have warm blankets on the beds though, and we were sound asleep by ten o'clock. 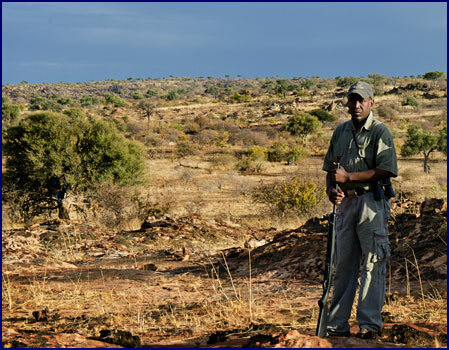 Our wake-up call was at six; one of the guides tapped on our door and called out dumela, which is Setswana for hello. We woke up feeling refreshed, excited to start the day. It was very cold when we poked our head out the door, and we put on our warmest clothes. We got a cup of hot tea in the lounge, and watched the tree dassies as they came out of hiding with the first hints of morning light. These furry little animals, also known as hyraxes, are about the size of a small groundhog, but much cuter. 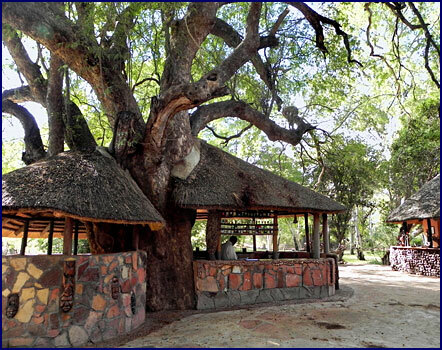 They are very active at dawn and dusk, running up and down the mashatu tree and the thatched roof of the bar. This last reminded me of a book I had read before the trip, an amusing memoir written by Peter Allison, a safari guide in Botswana, entitled Whatever You Do, Don�t Run. The author recounts being given this advice when he first started in the guiding business. �Food runs,� they told him, �and besides, there�s nothing here you can outrun anyway.� This in turn brought to mind the joke about the two brothers on safari. Fearing an imminent lion attack, one of them started lacing on his running shoes. His brother told him, �There�s no point in that, you can�t outrun a lion.� To which he replied, �I don�t need to outrun the lion, I just need to outrun you!� Unfortunately, I doubted that I could run faster than Jineen. Setting out across the lawn, we passed the ornamental waterfall, and then climbed the steep path behind it. The weather was cool, but the walking quickly warmed us up. We came to the top of the rock outcropping and looked out; before us was a wide rocky plain, dotted with sparse bushes, stunted trees, and rocky formations. In the foreground there was a pair of magnificent baobab trees, and a great mashatu tree with the sun peeking through its branches. Long slanting shafts of sunlight broke through the cloud cover, producing dramatic lighting and patches of blue. 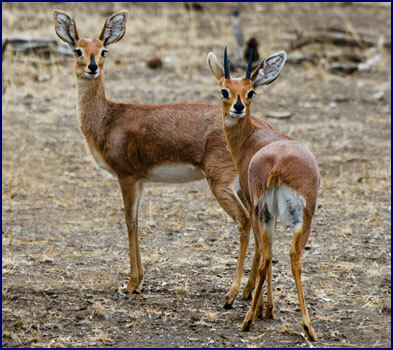 We encountered a pair of the tiny steenbok, standing only twenty inches tall, petite and dainty, the males sporting sharp spikey horns. Simon told us that they mate for life, and if you see one, you can usually locate its mate nearby. 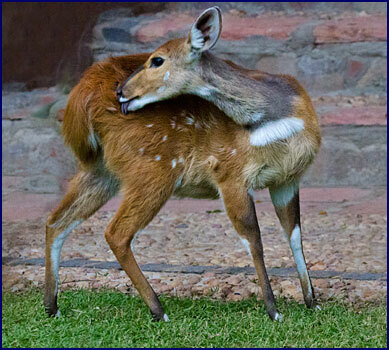 The Tswana people consider the steenbok to be an omen of good luck. Impala were everywhere, hard to miss. From the viewpoint of a rocky knoll, we saw a small group of zebras, a few elands, and a couple of giraffes. In the distance, we could see two elephants, making their stately way across the landscape. We were back at the lodge about ten o�clock, just in time for brunch. A long table was set up on a patio near the pool, and we joined the other guests for an excellent meal � there were about a dozen of us in total. After brunch Jineen and I climbed up the rock outcropping again, where we watched the rock dassies (close cousins to the tree dassies) as they scurried among the boulders. There were some excellent blue tailed lizards on the rocks, which we later learned were called five-lined skinks. Quite a lot of wildlife lived inside the lodge grounds. Dassies and squirrels inhabited the huge mashatu tree at the bar. 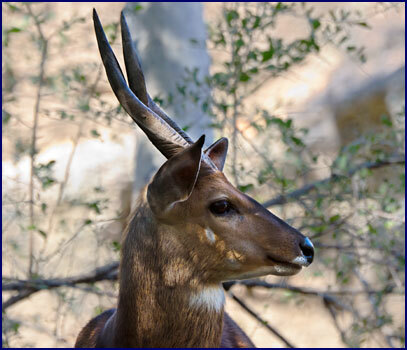 Several bushbucks grazed contentedly in camp; these deer-like antelope are quite pretty, with white spots on their sides, large round ears, and inquisitive faces. 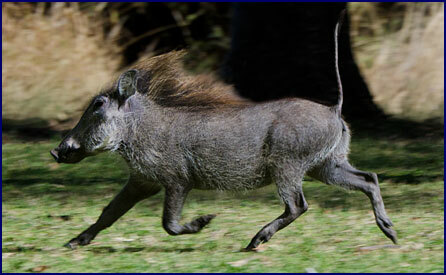 Warthogs and baboons are also regular visitors on the lawn. We saw a long slender snake by the steps to the bar; Simon identified it as a striped-bellied sand snake. The lodge schedule had free time from the end of brunch at eleven until afternoon tea at three-thirty; they suggested that during this quiet downtime one could read a book, take a nap, or go to the pool for a swim. Well, we didn�t come to Africa to take a nap or read a book, and it was way too cold to swim in the pool. Jineen and I coerced Simon into taking the two of us out on an extra bush walk. We walked out of the front gate. There were elephant signs close to the lodge; foot prints a half a meter across, and a huge elephant skull, weathered with age. We passed beneath the spreading canopies of several grand mashatu trees. Weaverbird nests hung from the branches. Impala lazed in the shade, and a small red squirrel chattered at us noisily from a limb overhead. We saw several shallow dry water holes, and Simon told us how they were formed. Impala produce piles of community dung, called dung middens. Then wildebeest, marking their territory, paw with their hooves and dig with their horns to get rid of the odor. Then wart hogs dig in it when it is wet, and elephants muck about in it after a rain, making it deeper. Pretty soon you have a rainy-season water hole. The clouds had cleared off and the sun shone bright in a blue sky. Simon led us to a small lake bordered by green vegetation amid the barren and rocky surroundings, like an oasis in the desert. There was a blind built beside it, where one could sit, protected, and wait to see what came down to drink. A Nile monitor lizard, nearly four feet long, sat basking in the sun on a log by the edge of the water. They are faster than they look, and swim quite well. Several chick ducks swam on the lake, and we could see turtles in the water � Simon said they are called terrapins. Five-lined skinks scampered over the rocks, their blue tails iridescent in the sun. A flash of motion across the water caught our attention � a slender mongoose darting among the rocks. 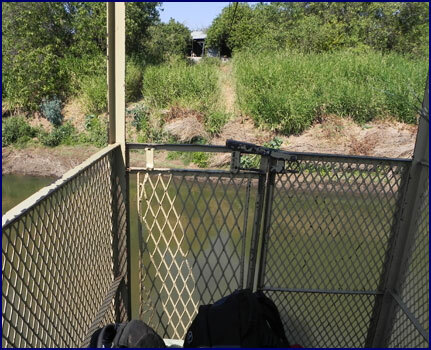 As we returned to camp, Simon showed us a second blind beside a small water hole and swamp; this one was right next to the camp. There were two big monitor lizards lying in the rushes, and more terrapins in the water. Simon pointed out some hyena dung, pure white with calcium from their habit of eating bones. Returning to the lodge, we still had a bit of time before afternoon tea. Not wanting to waste a minute, we explored the camp. The guest cabins were spread out around the grounds among the trees, with a wide expanse of green lawn between them. Dodging the sprinklers, we made our way toward the river. A family of warthogs were grazing on the lawn; they ran off when we approached, their tails held straight up over their backs.